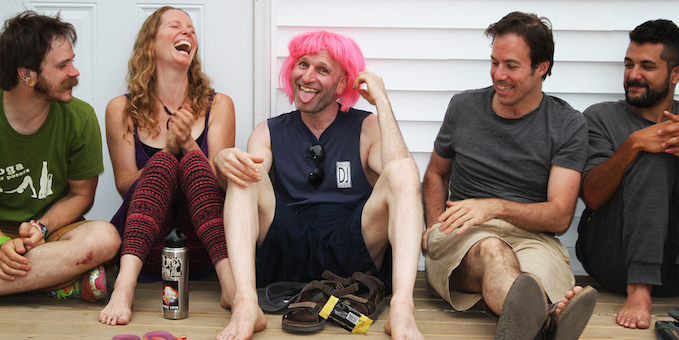 You may remember us introducing Amy Silverman, Founder of The Connection Movement and Connection Camp, in interviews last year and the year before. We love what Amy is doing, and the community she has built, so naturally we 'connected' again to explore new topics as well as get the scoop on plans for this year's camp coming up in Sussex, NJ, June 14-17th. It might appear that community is a fading phenomenon. Statistics show a steady decline in church and other organized religion attendance as well as decreasing participation in service clubs such as Rotary and Kiwanis. Yet the human need to belong is as strong as ever. Amy tells us that over one million people attended Adult Sleepaway Camps last year alone. These camps are intended to create deep and meaningful relationships, connect with nature, experience play, and practice self-expression and creativity in fun-filled multi-day retreats. To catch new readers up, Connection Camp is set at a kids’ summer sleepaway campground, providing the space and an itinerary of workshops and activities (from guided meditations to wine tastings to dance parties!). Campers spend 4 days and 3 nights interacting in different contexts — through play, conversation, and creative expression. This combination allows for uniquely rich relationships to form. After chatting with Laetitia, we gathered that even first-timers who don’t know a soul leave with renewed sense of community. Laetitia didn’t know anyone when she went to camp last year. Having never attended a sleepaway camp as a kid, she was keen to experience one as an adult. Andy and Heather (pictured above) met at camp last year. Although they didn't go looking for love necessarily, both felt their hearts open and walls crumble at camp. Over the course of the retreat, Andy says, “It felt like we did in three days what for most relationships happens in three months, in terms of the level of intimacy.” Their time at camp “laid a deep foundation” that enabled them to ride through the rougher times. They're still going strong a year later! Anyone who went to camp as a kid knows that camp friends are friends for life. It’s no different as adults. The opportunity to play, co-habitate, eat together, brush teeth together — creates bonds that cocktails in a city lounge likely doesn't. Amy and Jason met through the first Connection Camp three years ago, and even though they live in different cities, they see each other a few times a year. They easily pick up where they left off. Amy says they continue to use the communication and relating tools from workshops presented at camp. Olivia came to connection camp two years ago solo, and set her mind to return the following year in a relationship. So in 2017, she brought her boyfriend, Jonathan, to camp. Tawkify goes to Connection Camp! If you want to check out Connection Camp, use the code Tawkify to save $40 on your registration. And tell us all about your experience afterwards. Connection Camp will be assigning 'secret sweeties' (everyone is matched secretly to someone who they will do nice things for over the course of the weekend), group activities, and 40+ offerings from teachers and healers (think yoga by the lake, zouk dancing, authentic conversations, and a DJ’ed pool party). Here’s to s’mores, new friends, and even some new romances blooming this summer!